In Europe and America, the prognosis of malignant tumors of the nose and sinuses is about 25%–35% 5-year cure rate. In our environment, there are no specific data, and the prognosis is much worse. The aim of this study is to evaluate the pattern of presentation and management outcome of sinonasal tumor in University of Ilorin Teaching Hospital, Ilorin, Nigeria. A retrospective review of all the patients with clinical diagnosis of sinonasal tumor seen in Ear, Nose, and Throat Department of the hospital between January 2008 and December 2013 was reviewed. The institution is a tertiary health institution and manages patients referred from primary, secondary, and other tertiary health institutions in Nigeria and some West Africa Countries. Clinic records were reviewed using the case files of patients with the clinical diagnosis and information extracted includes demographic data, duration of symptoms, clinical presentation, and stage of the disease at presentation, identifiable risk factors, histopathological findings and outcome. Ethical approval was obtained from University of Ilorin teaching hospital ethical review committee. All information retrieved were entered into SPSS (Chicago, Illinois, USA) statistical software version 17 computer software and analyzed descriptively and the results are presented in tables and figures. Level of significance was considered at P < 0.005 at 95% confidence interval. A total of 71 patients with head and neck cancers were seen during the period of study. 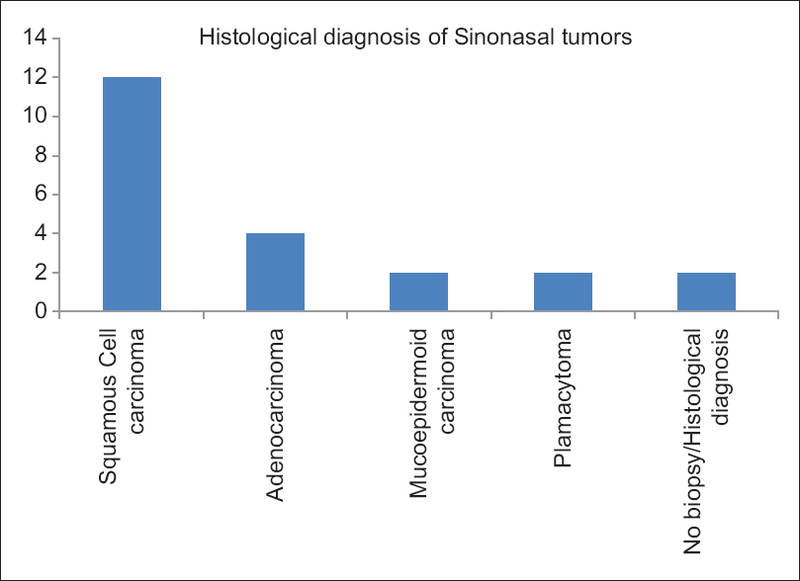 Out of which, 22 (31%) patients had clinical diagnosis of sinonasal tumors. Age ranges from 40 to 70 years of age with mean age of 51 years (SD = 19.6 ± 2.1) the age distribution as shown in [Table 1]. There are about 10 males and 12 females in the ratio of 1:1.2. 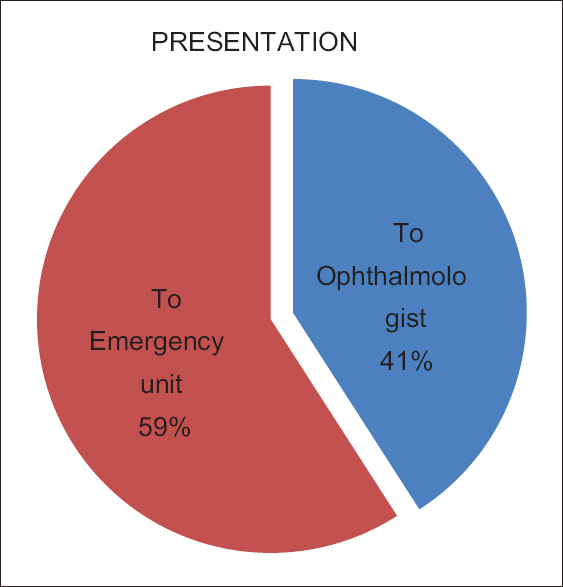 Epistaxis, progressive nasal blockage, and discharge were seen in all patients depending on the part of the nostrils involved, though 9 (41%) had proptosis with visual impairment/facial asymmetry and presented first to the ophthalmologist. Others presented through the Emergency unit of the Hospital due to epistaxis [Figure 1]. Identifiable risk factors were exposure to wood dust and indoor cooking 13 (29%) and petrochemical products 5 (11%). No specific risk factors were identified in others. Smoking in 8 (18%), alcohol in 9 (20%), and both in 4 (9%), no information in 6 (13%) of the case notes [Figure 2]. Most patients presented first at advanced stages of the disease (Stages III–IV) in 18 (82%), whereas 4 (18%) presented early at Stage I–II of the disease. The duration of symptoms before presentation to hospital was between 6 months and 2 years with mean duration of 10 months with recurrent epistaxis, nasal blockage, and visual symptoms. Five (27.3%) presented between 6 months and 11 months of onset of symptoms, 8 (36.7%) patients presented more than 12 months after the onset of symptoms, 7 (31.8%) presented between 14 months and 24 months after the onset of the symptom, and 2 (4.2%) did not fill the duration of presentation [Table 2]. The factors found to be responsible for delay in presentation at hospitals included self-medication in 8 (36.7%) patients, wrong advice in 7 (31.8%) patients (patients' visits to quacks in 3 [13.6%], and traditional healers in 4 [18.2%]), religious belief in 1 (4.6%), and no reason in 3 (13.6%). The right sinonasal region was involved in 10 (45%) patients and left sinonasal region in 9 (40%) patients, whereas 3 (15%) patients had bilateral involvement. Histologically, well-differentiated squamous cell carcinoma was the most common 12 (54.6%). Nonintestinal well-differentiated adenocarcinoma 4 (18.2%), mucoepidermoid 2 (9.1%), and plasmacytoma 2 (9.1%), whereas 2 (9.1%) of the patient did not undergo incisional biopsy for histological diagnosis [Figure 3]. Chemoradiation was the mainstay of management in 10 (45.5%). Although 3 (13.6%) had total maxillectomy with postsurgical chemoradiation and 9 (40.9%) defaulted due to the cost of management. In the Western world, sinonasal cancer is about 0.5%–1% of all malignancies and 3% of all head and neck tumors. It is said to be common in the fifth and sixth decade of life. In our finding, majority of the patients were in the fifth decade of life which agrees with the literature. In this study, the average duration of symptoms before presentation to hospital was 10 months this in contrast to Brent and Michael who documented 6 months as the average delay between first symptom and diagnosis of sinonasal malignancy. The previous study has suggested that the natural hidden location of the tumor at the early disease stage within the paranasal sinuses and its nonspecific presentation masquerading as chronic inflammatory disease (Rhinosinusitis) contribute to the delay in diagnosis of the disease.,, However, the sociocultural beliefs and practices such as self-medication, use of herbs, and over-the-counter drugs to manage their illnesses, wrong advice from relations and friends to seek alternative treatment as well as traditional and religious beliefs of the people in our environment may also contribute to the delay in presentation to hospitals,, this is similar to the previous report from Southwestern part of Nigeria. This might have contributed to having 12 (54.6%) patients with squamous cell carcinoma presenting in advanced disease stage (Stage III and IV). There is a need for health education to raise the level of understanding of patients about the risk associated with self-medication, the havoc being caused by the alternative treatment and the risk of delay in presentation to hospitals so as to seek appropriate treatment early. Prompt diagnosis of diseases by qualified health personnel and institution for appropriate treatments are important measures in achieving good outcome and improved quality of life in patients with sinonasal tumor. Health education should, therefore, be directed toward everyone in the community since the decision of where to seek treatment involves patients, relatives, and their caregivers. They should be educated on the benefits of attending hospitals where there are competent health personnel's that can make proper diagnosis and institute appropriate treatment. The clinical presentations of the patients were similar to earlier reports in the literature as majority of the patients presented with progressive nasal blockage, nasal discharge, epistaxis, and proptosis. Epistaxis is one of the early clinical presentations of sinonasal tumor and all the patients in this study presented with it. It is a common traditional practice in our environment to drop juice extract from mashed special local leaf called “Efirin” (Ocimum basilicum) into the nasal cavity along with the squeezed leaves when an individual develops epistaxis to stop the nasal bleed; however, in our report, only three of the patients had documentation on the use of these leaves for the treatment of epistaxis which does not abates the nasal bleed; this may probably be due to the massive nature of the bleed. Although it may stop nasal bleeding occasionally, the herbal concoction may also contain injurious substances which can further worsen the patient's general health condition. This temporal relieve of cure evidenced by nasal bleeding stoppage may contribute to the delay in presentation in the hospital. Unconfirmed evidence from this study may be economic reason as the previous study reported that only 0.6% of rural dweller in Nigeria present in hospital when they develop disease., These may be a product of high level of poverty in our resource-challenged environment and also the nonfunctionality of the primary and secondary health-care system in our environment with high influx of patient into the only functional tertiary health care located in the central capital usually may be a contributory factor to delay in presentation for treatment, although this was not found in our study being a retrospective review, it will be a useful information to look at in future prospective study. Traditional medicine is undoubtedly an alternative approach to health-care delivery in Nigeria of today because it is considered cheap, accessible with a lot of advertisement, and marketing strategy. About 41% of our patient from these report presented to the ophthalmologist in view of the earlier worsening visual symptom overshadowing the nasal symptoms in their own case. These cases require multidisciplinary approach in their management thus the need for joint evaluation for early diagnosis and adoption of best treatment protocol. Patient presenting with either unilateral or bilateral proptosis with one or more nasal symptoms should be well evaluated for sinonasal tumor as tumors may invade the orbit through preformed pathways, through neurovascular structures, or by direct extension through bone. Literature has shown that tumor extension into the orbit occurs particularly in ethmoid tumors because of the thin lamina papyracea separating the 2 structures. Invasion of the orbital wall is present in 66% to 82% of the patients with ethmoidal malignancy,, with the involvement of the orbital periosteum in 30% to 50% of patients., Orbital invasion (bone erosion/invasion) occurs in 60% to 80% of maxillary sinus malignancies. Most of our patients presented at advance stages of the disease and were therefore referred for chemoradiotherapy since such facility is not yet available in our center, only three had early presentation with maxillectomy with good outcome but were lost to follow-up after 6 months with no recurrence. 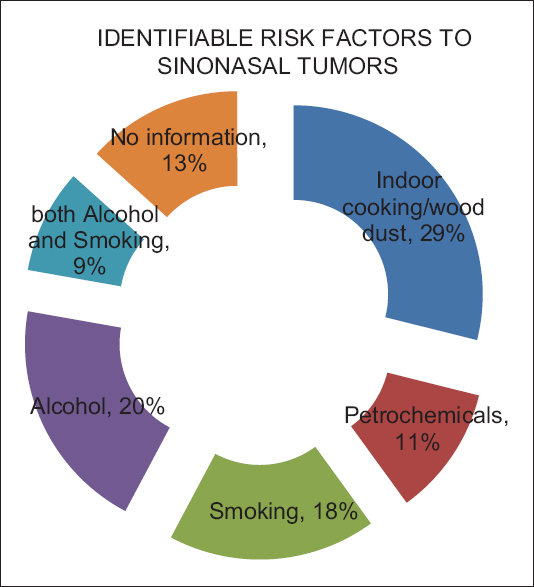 Sinonasal tumor is an uncommon tumor with majority of the victims presenting late affects more female than males and those in the fifth decade of life are worse affected, the most common risk factor in our environment is wood dust followed by petrochemicals. Epistaxis and proptosis with visual symptoms are the reason for the first presentation in some of the patients. The most common modality of treatment is still chemoradiotherapy due to late presentation. Health education among the patients and the community will go a long way in early presentation and detection. Collaboration with the ophthalmologist in complete evaluation of every patient with unilateral proptosis will reduce the complication and morbidity from the disease. Goepfert H, Luna MA, Lindberg RD, White AK. Malignant salivary gland tumors of the paranasal sinuses and nasal cavity. Arch Otolaryngol 1983;109:662-8. Osguthorpe JD. Sinus neoplasia. Arch Otolaryngol Head Neck Surg 1994;120:19-25. Maran AG, editor. Cancer of the nose and sinuses. In: Logan Turner's Diseases of the Nose, Throat and Ear. 10th ed. Oxford: Butterworths/Heinemann; 1994. p. 209-11. Curtin HD, Tabor EK. Nose, paranasal sinuses, and facial bones. In: Latchaw RE, editor. MR and CT Imaging of the Head, Neck, and Spine. 2nd ed. St. Louis: Mosby Year Book; 1991. p. 947-90. Weber AL. Tumors of the paranasal sinuses. Otolaryngol Clin North Am 1988;21:439-54. Lango MN, Topham NS, Perlis CS, Flieder DB, Weaver MW, Turaka A, et al. Surgery in the Multimodality Treatment of Sinonasal Malignancies 2010;34:304-21. Groves J, Gray RF, editors. Tumours and cysts of the nose, paranasal sinuses and jaws. In: A Synopsis of Otolaryngology. 4th ed. Bristol: Wright; 1985. p. 215-26. Ologe FE, Adeniji KA. Clinico-pathological study of nasal masses in lIorin, Nigeria. Niger J Surg 2003;9:14-8. Nepal A, Joshi RR, Chettri ST, Karki S. Pattern of sinonasal tumor in eastern Nepal. Nepal J ENT Head Neck Surg 2010;2:9-11.
da Lilly-Tariah OB. Cancer of the nose and paranasal sinuses in 10 yrs. : A ten year study. West Afr J ORL HNS 1999;2:11-6. Fasunla AJ, Ogunkeyede SA. Factors contributing to poor management outcome of sinonasal malignancies in South-west Nigeria. Ghana Med J 2013;47:10-5. Brent AM, Michael G. Nasal cavity and paranasal sinus malignancy. In: Mcheal G, George GB, Ray C, Valerie JL, John CW, editors. Scott-Brown's Otolaryngology, Head and Neck Surgery. 7th ed., Vol. 2. London: Edward Arnold Publisher Ltd.; 2008. p. 2417-36. Ogunleye AO, Ijaduola GT, Sandabe MB. Usual and unusual features of sinonasal cancer in Nigerian Africans: A prospective study of 27 patients. Ear Nose Throat J 2008;87:E13-7. Afolabi OA, Ehalaiye BF, Fadare JO, Abdur-Rahman AB, Ehalaiye DN. Survey of ototopical self medication among patients attending ENT and family medicine departments in a Nigerian hospital. Eur J Gen Pract 2011;17:167-70. Goodwin JS, Tangum MR. Battling quackery: Attitudes about micronutrient supplements in American academic medicine. Arch Intern Med 1998;158:2187-91. Olowokudejo JD, Kadiri AB, Travih VA. An ethnobotanical survey of herbal markets and medicinal plants in Lagos State of Nigeria. Ethnobotanical Leafl 2008;12:851-65. Suárez C, Ferlito A, Lund VJ, Silver CE, Fagan JJ, Rodrigo JP, et al. Management of the orbit in malignant sinonasal tumors. Head Neck 2008;30:242-50. Iannetti G, Valentini V, Rinna C, Ventucci E, Marianetti TM. Ethmoido-orbital tumors: Our experience. J Craniofac Surg 2005;16:1085-91. Ganly I, Patel SG, Singh B, Kraus DH, Bridger PG, Cantu G, et al. Craniofacial resection for malignant paranasal sinus tumors: Report of an International Collaborative Study. Head Neck 2005;27:575-84. Suarez C, Llorente JL, Fernandez De Leon R, Maseda E, Lopez A. Prognostic factors in sinonasal tumors involving the anterior skull base. Head Neck 2004;26:136-44. Carrau RL, Segas J, Nuss DW, Snyderman CH, Janecka IP, Myers EN, et al. Squamous cell carcinoma of the sinonasal tract invading the orbit. Laryngoscope 1999;109 (2 Pt 1):230-5.